A slipped disc can happen anywhere in the spine, and does not actually slip. 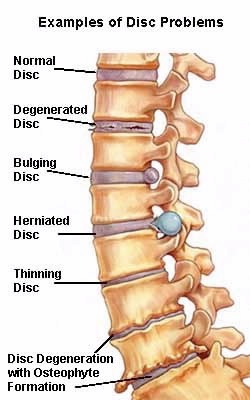 Instead, the disc, which is located between the bones of the spine (vertebrae), splits or ruptures. When this happens, the inner gel-like substance (nucleus pulposus) leaks out. This is called a herniation of the nucleus pulposus—or a herniated disc. People between the ages of 30 and 50 are most at risk for herniation because the elasticity and water content of the nucleus pulposus decrease with age. Symptoms of a herniated disc may include dull or sharp pain, muscle spasm or cramping, weakness, tingling, or referred pain. Referred pain means that you have pain in another part of your part as a result of the disc problem. For example, if you have a bulging disc or a herniated disc in your low back (lumbar spine), you may have referred pain in your leg. This is known as sciatica—a shooting pain that can extend from the buttock into the leg and sometimes into the foot. Usually just one leg is affected. If you have a herniated disc in your neck (cervical spine), you may have referred pain down your arm and into your hand. Leg and arm pain caused by a herniated disc is also called radiculopathy. It's very rare, but herniated discs can cause you to lose bowel or bladder control. If this happens, seek medical attention at once. Pain from a herniated disc is often the result of daily wear and tear on the spine. However, it may also be caused by an injury. Pain is sometimes the result of pinched nerves that are crowded by the leaking nucleus pulposus. A herniated disc can occur slowly over time, taking weeks or months to reach the point when you feel you must seek medical attention. Or, pain may occur suddenly from incorrect lifting or twisting that aggravates a weak disc. If this is the case, call your doctor right away. 1.Disc Degeneration: During the first stage, the nucleus pulposus weakens due to chemical changes in the disc associated with age. At this state no bulging (herniation) occurs. 2.Prolapse: During prolapse, the form or position of the disc changes. A slight bulge or protrusion begins to form, which might begin to crowd the spinal cord. 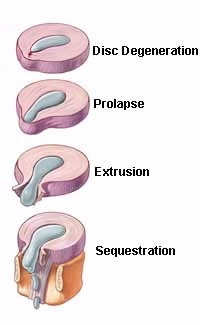 3.Extrusion: During extrusion, the gel-like nucleus pulposus breaks through the tire-like wall of the annulus fibrosus but still remains within the disc. 4.Sequestration: During the last stage, the nucleus pulposus breaks through the anulus fibrosus and even moves outside the disc in the spinal canal.